On this page you find promotion material which we don't offer in a printed version anymore. However you can of course use linked files to spread the information material online or print it yourself for your event. The archive is ordered chronologically to maintain a better overview. However the table below orders all our archived promotion material by category. Click on one item to be forwarded directly to the full description and download links. 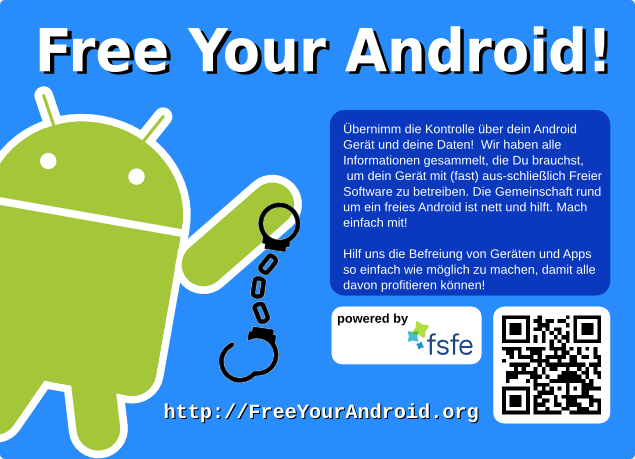 This is a temporary and limited edition of our stickers to celebrate 15 years of FSFE. Get yours before they run-out! A sticker to let people know about their online-reality that says "There is no cloud just other people's computers"
A poster to let people know about their online-reality that says "There is no cloud just other people's computers"
The flyer to promote our Document Freedom Day campaign. It says the date, homepage and a short message in six languages. 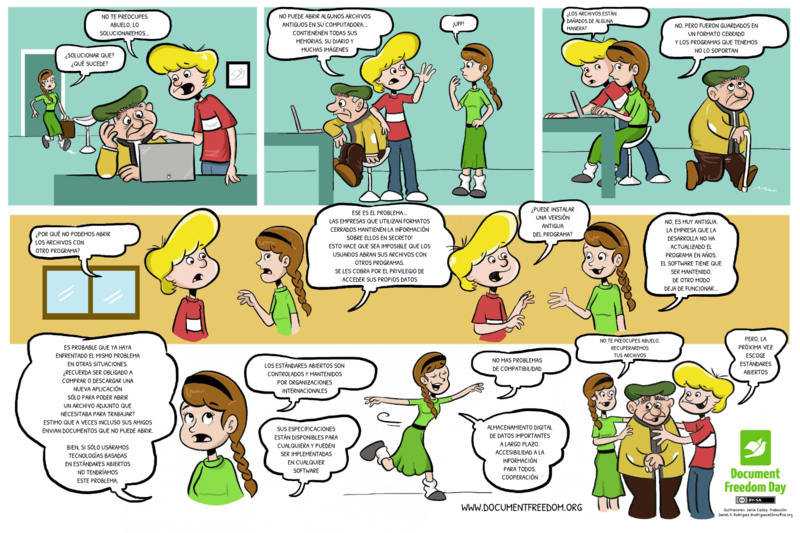 The "Open Standards" postcards address our Document Freedom Day campaign. Send them throughout the entire world! 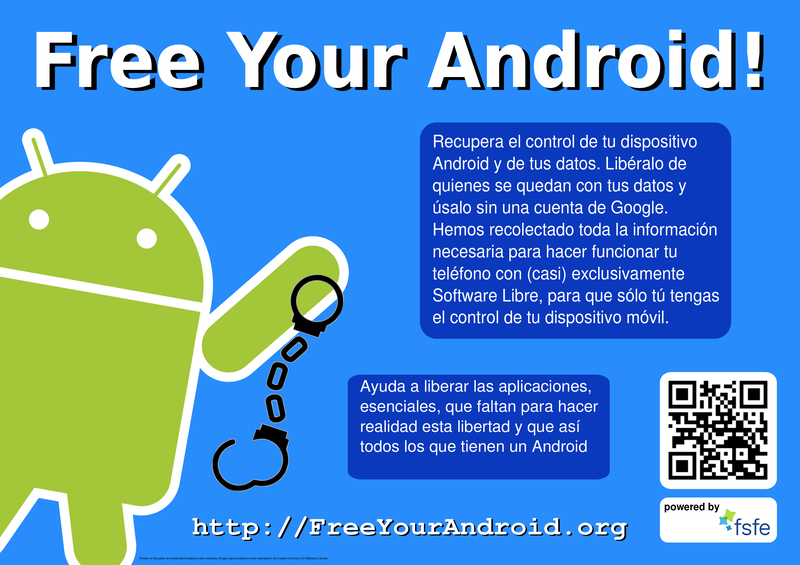 The leaflet to promote our Document Freedom Day campaign. It comes with explanations what standards are for, what is an Open Standard and how to engage for Document Freedom. 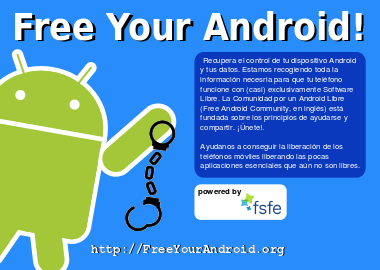 The poster to promote our "Free Your Android" campaign for which there are flyers available, too. This poster proofed to be very eye-catching and attracts a lot of people at booths who ask about the backgrounds of this campaign. We recommend to use it at any booth or other public activity. The "Open Standards" stickers address our Document Freedom Day campaign. The robots are the logo of the campaign. A cartoon series to promote the Document Freedom Day campaign. On the other side of the printed English version you can find an illustrated explanation of the open formats poster. 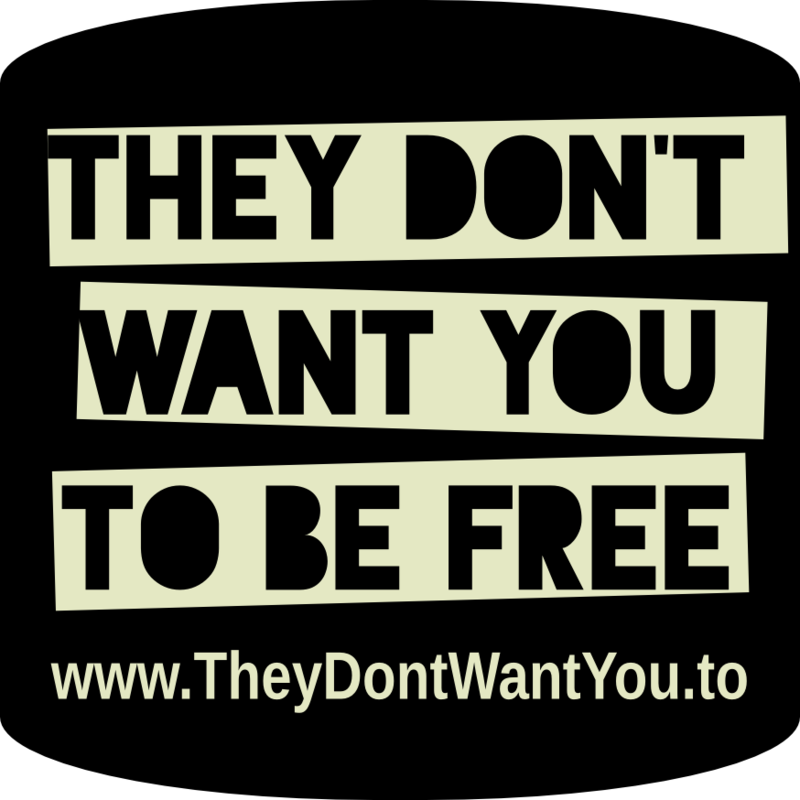 A sticker with the slogan "They don't want you to be free" to promote our They Dont Want You.To campaign. 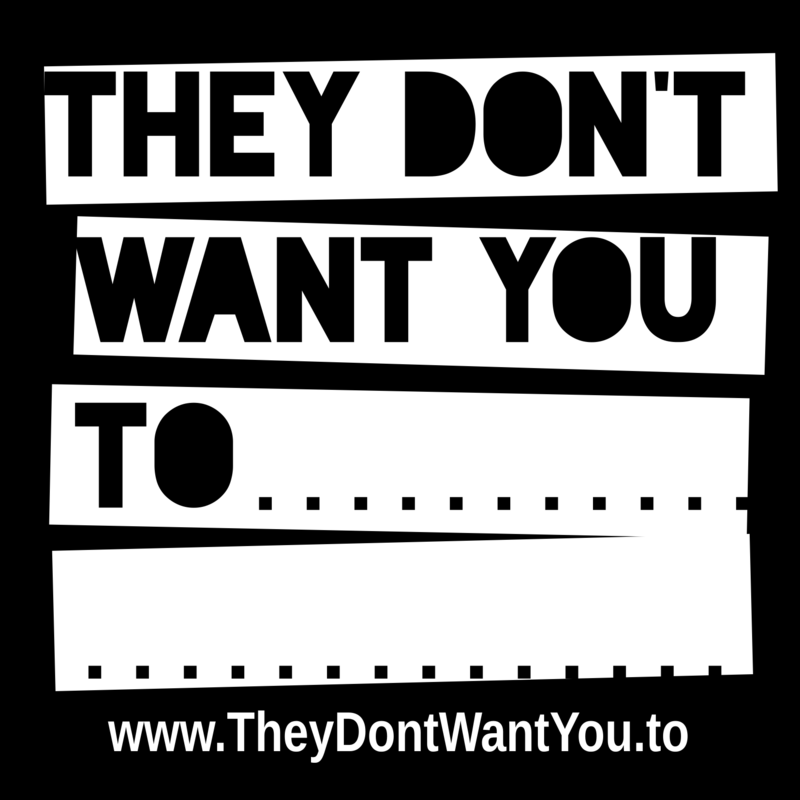 A sticker with the text "They don't want you to ..." to promote our They Dont Want You.To campaign against locking down of products and services. A sticker with the warning sign "Freedom Not Included" in English, Spanish, Polish, German, Italian, French, Greek to promote our They Dont Want You.To campaign. Our Fellowship leaflets are in size A5, so they fit perfectly into our FSFE folder (see item above). It is a nice piece of a graphical artwork, promoting the Fellowship. The "Join the Fellowship" poster is to promote the Fellowship and therefore to pin on a prominent place, for example inside a meeting room or a Hackerspace - and for use at any public activity. On the inside of our FSFE folders, there is written some core information about FSFE and our work, about Free Software and how to contribute. These folders can be used as a briefcase for additional material with more information inside. In size A5, we normally put our political leaflets and/or our Fellowship leaflets (see next item). Folders in size A4 can be useful in other contexts, for example at a conference. The Plussy is a symbol of our community. The background is transparent, so the sticker integrates perfectly in any surrounding - not just on laptops. 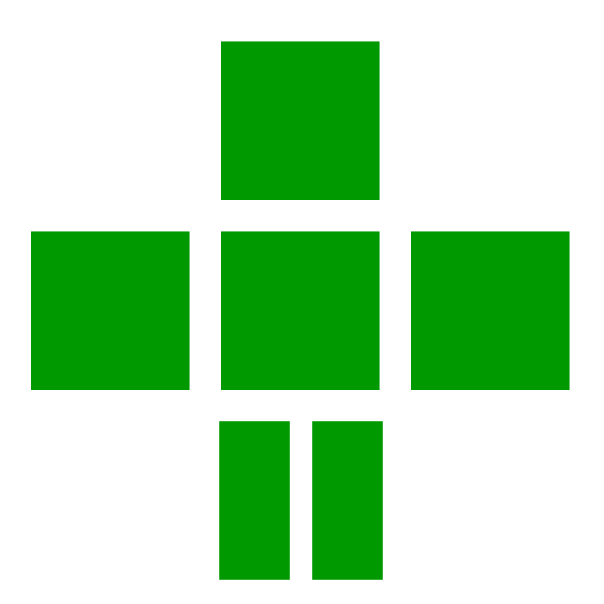 License: The "Fellowship logo" (and variations of it) can be used to advertise the FSFE and its community in association with any Free Software related activity performed by FSFE supporters. However, if you do not have a mandate by FSFE, we ask you not to create the impression that you speak officially for FSFE, or that FSFE has certified or endorsed you to do so in any way.